These pictures were sent to me by Dr. L. Weidinger from Germany. 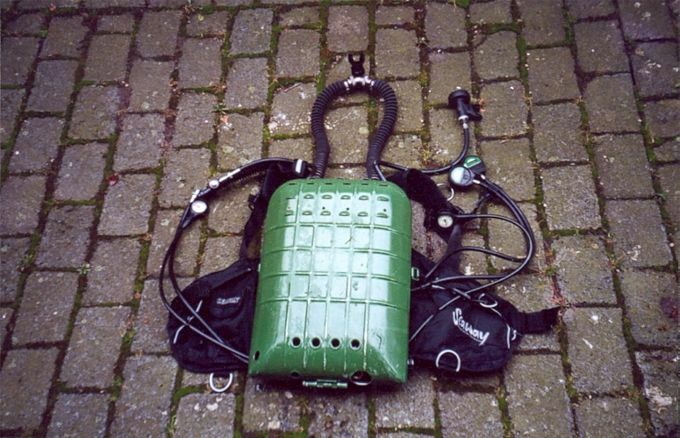 Read how he built this unit made of a former Russian IDA 71 and a German RG-UF/M tank rebreather. 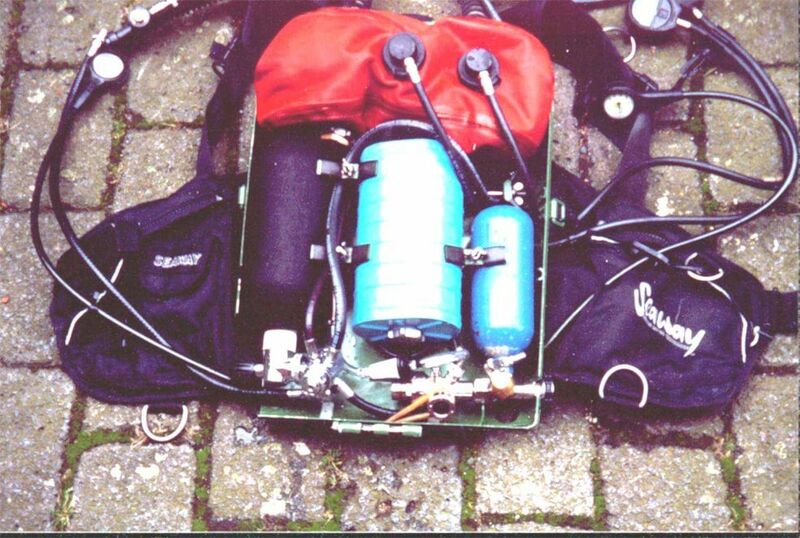 I have all gases and bottles inside the chassis of the IDA 71 rebreather. The black cylinder (the volume is 2 liters, I think that in your mind this looks like a Atlantis scrubber, but in fact it is a cylinder) on the left side is my bailout-diluent-BC-drysuit-inflation-gascylinder. Normally I use a Nitrox 50/50 for my easy and recreational dives up to 20 m. I only use one of the original scrubbers (the blue on the picture) and without any 'Super oxide.' (note: the original IDA71 is equipped with a Super oxide canister who absorbs CO2 and water and delivers oxygen). The left two ports for the unused scrubber coming from the breathing bag I closed with brass blanking plugs. I don't use the original Russian Oxygen and Nitrox cylinders and all the low and high pressure gas-lines in and outside the chassis. I only use the original second stage regulator inside the breathing bag. I installed the RG-UF/M cylinder (filled with oxygen) on the right side of the chassis. The CMF-Regulator (0,9l/ min) of the RG-UF/M I used as a constant flow oxygen injection. Oxygen-injection is nearly always equivalent to my needs of oxygen. The injection line is connected to that port at the counter lung, it was originally the gas-input for the purge cycle to wash out oxygen or Nitrox. 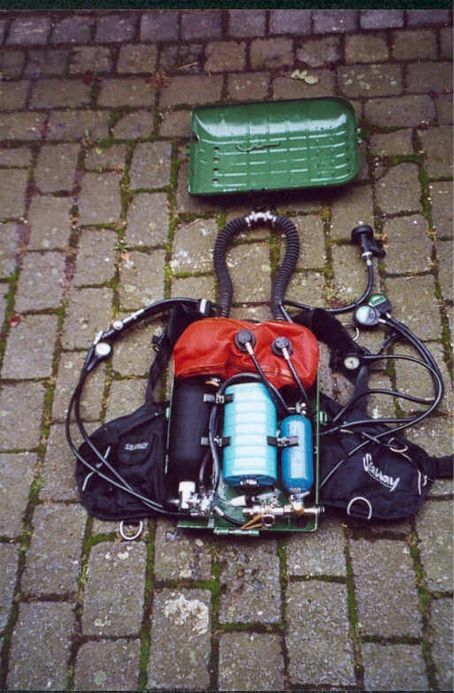 The black 2-l-bottle is connected to the original port of the second regulator-stage inside the breathing bag. This is necessary in order to add diluent in the loop and for compensation of the counter lung when the volume gets to small. It works automatically, if needed. 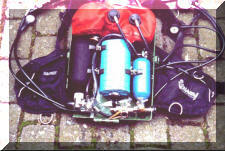 So the system is a fully closed Nitrox rebreather with automatically oxygen and Diluent gas-injection. But you can dive the rig manually too. It is easy to inflate two gases manually by pressing the inflation-knobs. And is possible to use all kinds of different gas as Diluent. For controlling the PPO2 I installed two Drager Oxygauges. I want to thank Dr. Lothar Weidinger for his contribution to my rebreathersite!